Most server racks have 4 vertical uprights. These uprights (aka Rack Rails or Mounting Posts) have mounting holes on standard EIA spacing and are used to attach equipment. There are three types of uprights: “L”, “C” and “?” (shown below). For more information on why upright shapes can cause equipment installation problems, read “Why all racks are not created equal“. This entry was posted on Saturday, October 13th, 2007 at 12:46 pm	and is filed under Terminology. You can follow any responses to this entry through the RSS 2.0 feed. You can leave a response, or trackback from your own site. For the C type, is the width always same as the two-posts rack frame? which is 3 inch wide? 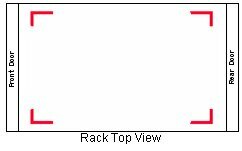 There is no set dimension for the side channel of the racks. Each manufacturer has their own design for the side channels or side posts. Some manufacturer’s have different types of uprights available for their racks depending upon what types of equipment your are installing.